My family of 4 had a lovely day with Lau and the driver. The vehicle was comfortable, we had cold water and icy cold cloths after every stop and we did not feel rushed at all as we toured the many temples on the schedule. The day was extremely hot but Lau made it so worthwhile despite the heat. He had a great sense of humor, was very knowledgeable about the temples, the history of how they were built and the culture that impacted the area. Highly recommend Lau!!!! Thank you Tours by Locals. A different kind of tour by vintage Jeep. Dusty but fun. Lao was very organised with dust masks and water and cold towels. Good to see the countryside life. Very special time of day. Lao was very organised with cold towels and water and went at our pace. Perfect tour for us. Lao was on time, very helpful and informative. My daughter & I had a wonderful time visiting the temples.He recommended a good restaurant after the end of the tour. Lao is a wonderful and patient guide. His command of English is terrific. I would highly recommend him! We had a wonderfull time with Lao. He is a very friendly and open guy with a good energy. He speaks good English and has nice stories. We visited three temples: Angkor Wat, the Bayon and Ta Prohm. He explained the history very well and explained all kind of details that were to be seen on the walls. There was a car available with cold water and cold towels. We will gladly tour with him again. Lao was an amazing guide for my wife and I. He promptly picked us up at our hotel and worked hard to help us quickly navigate ticket lines and found us a great spot to watch the sunrise. After Angkor Wat we stopped for a relaxing coffee and our packed breakfast. Angkor Thom and "Tomb Raider" were also amazing tours. Lao provided great background and information on the art and legends seen throughout the day. We were never hurried and could go as fast or slow as we liked. Also, his english was superb! I highly recommend Lao----very attentive, knowledgeable and caring and we had a amazing holiday. He would give you good advise and suggestions and tailor everything to suit your needs. Should I re-visit, I will book him again---he won't let you down! We spent two exceptional and memorable days with Lao and driver who was kind and helpful by providing water, cool towels and insuring our comfort. We requested a change in itinerary. Lao graciously created a new design. Lao is fluent in English, intelligent, kind, flexible. He is extremely well informed and imparts his knowledge of temples and Cambodian history in a stimulating way. Lao is also a great photographer. If you want the best guide ever, choose Lao. Lao was extremely knowledgeable and made it fun for us - overall great experience and I've recommended him to all my friends. Lao picked me up right on time in a nice, clean Lexus SUV. It was stocked with cold water and cold washcloths which were refreshing after each stop. His English is fantastic and he is well educated on all things related to the temples and tour, as well as Cambodian history. He is also a good photographer so he knows the best spots to take photographs and can also take one of you if needed. Communication via WhatsApp was easy as well. I recommend him with no reservations. 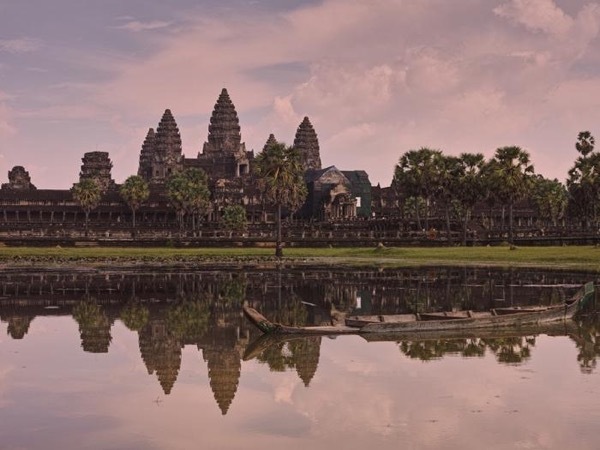 If you are thinking of going to Angkor Wat, you need to take this tour. Lao was an excellent guide who was extremely knowledgeable and friendly. His depth of knowledge gave us real perspective on the history of both the temples and Cambodia. I cannot recommend Lao and this tour enough! Our tour with Lao was absolutely terrific. Not only is he extremely knowledgeable about the temples and the history and culture of the region, but he was great company during our 3 days in Siem Reap. He speaks excellent English and was very attuned to our priorities and needs. Lao and the driver met us at the airport, took us to our hotel, and drove us everywhere we wanted to go, providing informative commentary along the way. It was the highlight of our trip to Southeast Asia. Well worth the cost. Lao was very knowledgeable but also made it fun. The best way to see Angkor Wat and the other temples. We are a family of four so went in two tuk tuks but after a while we were templed out. Lao took us to a great place for lunch. One recommendation for all is to think twice about how many days you will be going in the Angkor Wat area. I only bought one day passes for the temples but you also need them for the roads and other activities in the area. We took a 2-day tour with Lao. Our first day was the Angkor Wat. He is very knowledgeable and a great narrator of the history, significance and meaning of the sculptures and carvings. He was also able to route away from pushy tourists from other tours. The second day was a tour of the water village of Tonle Sap. Again, I am impressed with his knowledge of the lives of people in the village. His tips for dealing with persistent salespeople were helpful. Lao is a wonderful guide for senior citizens. We had a fantastic 3 days with our guide Lao - we tailored parts of it to suit ourselves and really enjoyed travelling in his army jeep! Highly recommend! Chheuy H (Lao) was the most brilliant tour guide my friend and I have ever come across! He was extremely knowledgeable, super friendly and accommodating to our every need. A very special thank you to his friendly driver also. Lao's tour is highly recommended if you're ever in Siem Reap!! Thanks again Lao, hope to see you in the near future on our next trip to Cambodia! Lao was an amazing tour guide who was absolutely the highlight of our trip to Cambodia. He was so accommodating, knowledgable, and friendly and he really really looked after us. He contacted us a few times before the trip with additional information and answered all our questions. His English is perfect. A charming and intelligent young Cambodian who is extremely proud of his beautiful country. Our private tour with Lao, via cool vintage Jeep, was the perfect way to see the stunning Angkor Wat and surrounding areas of Siem Reap. Lao's considerate touches made the experience ideal -- with everything from a delicious packed lunch to ice cold towels--heaven after a trek in the hot, humid climate. He addressed every question thoughtfully and knew his history and culture expertly. Thanks to Lao, we felt like we better understood the region and the landscape AND had a rich experience in the process! Lao was an amazing tour guide! We had such a good day and he was so accommodating to our last minute change in plans. He's got a great knowledge of the temples and is very easy to talk to. 100% recommend! Lao is an excellent guide, fluent in English (a college graduate in English, no less!) and well versed in the history of Cambodia. He's always smiling, ever helpful and accommodating and I sensed in him a great pride for his culture. The driver is also extremely nice, always keeping the car clean (we had muddy shoes), and supplying us with icy cold bottles water and towels. A lovely day out. I would definitely recommend Lao to anyone who comes to Siem Reap. Lao is a perfect guide for visiting Siem Reap, his knowledge of history and places around is wonderful. Thanks to his very good english all questions will be answered. Our visit to Angkor Wat complex was more than we expected, as Lao picks up the best routes and views. I would highly recommend him for all visitors and would book a new tour with him anytime. Thank You so much, Lao! My tour was excellent and custom designed for a senior citizen. One of the best tours and tour guides I have ever been with. Lao was able to answer any questions and was very considerate in everything we did. Lao was an awesome tour guide. He was punctual and had a great sense of humor. We did the private tour to see Ankor Wat. It was raining that day and it was still hot. The lemongrass cold towels and chilled bottled waters made our tour memorable. Lao was very informative on the history of the locations he took us took and even help us out with the perfect our photo sessions. He speaks English well and will try to answer your questions the best he can. I highly recommend this tour guide. Lao met me at my hotel at 5am for the Angkor Wat Sunrise Tour. It was crowded but a beautiful site. He then took me to other temples and told me the stories and history behind many of the murals and architecture. I highly recommend him as he speaks great English and has good knowledge behind him as well as being super friendly. Lao and his driver were fantastic. We really enjoyed the personal tour by Lao and got the right dose of temples. Lao knew his ways inside out and all the stories about this fascinating place. He spoke fluent English and was enthusiastic, friendly, and simply a great companion for the day. Thank you for making our visit so enjoyable. Lao is an excellent tour guide. He is extremely knowledgable about Angkor Wat and the temples, and provides an excellent tour. He provided a 2 day tour for us, the first day was cycling to see the temples. Day 2 was further out to additional temples and to see local living in the area. I highly recommend Lao as your personal tour guide! Lao is very knowledgeable, and speaks well. He's everready to share any information when I ask him. We had a great day with him. We would love to spend another day with him, but too bad, he's being booked for the weekend. Anyway, I will be back to Siem Reap again! Looking forward to meet you again! Take care & Thank you for th wonderful experience In Cambodia ! TOUR GUIDE RESPONSE: Dear Aaron, Thank you very much for taking time giving your sweet words. I am absolutely excited that my services have exceeded your satisfaction. God bless you! A very good tour with interesting information from our guide. Very high service level. I can highly recomend this! Lao was a fantastic knowledgeable guide, both professional and warm. He is passionate about his subject, and was kind and patient while I also dealt with a family emergency back home. I highly recommend! Lao was fantastic, with excellent English & knowledge. He was very kind when my daughter was not feeling well & went out of his way to accommodate this. TOUR GUIDE RESPONSE: Thank you, Tina, for your rating. Hope to see you again in Cambodia. My family of 6 booked the Kompong Pluk tour and Angkor Wat day tour with Chheuy H last Christmas. The experience was great! Chheuy H was such a wonderful and friendly guide. He could answer all of our questions and was very kind. He is into photography himself so my brother and I who had our own DSLRs could nerd out about cameras with him and he even offered to switch out and lend his camera lens to us for us to play with, and of course, it was nice having him help us take our group photos. Chheuy (Lao) is an exceptional guide. He is flexible—willing to tailor his tours to fit specific interests/needs—and easy to work with. He speaks excellent English, is personable, and has impressive knowledge of the history, origins, design and cultural context for the temples surrounding Siem Reap. And he is an astute observer of local traditions and politics. His tour included the "must see" temples and lesser known temples that were beautiful, yet untainted by mobs of tourists. I highly recommend Lao. Could not have had a better guide. Very friendly, knowledge and extremely polite and fun. Lots of fun and stories and laughter. We can recommend him very highly and will book with him again. Good job Lao and good luck. Your friends from Switzerland. Lao was a pleasure to tour with through the temples. He was very informative and let us go at our own pace. As we had a short time in Siem Reap, he picked us up at the airport with the driver and we started from there. It was great having cold water and cold towels provided to us along the tour. Lao was light hearted a fun to be with. He ensured that we were checked into our hotel before leaving us for the day. I would definitely recommend him. Lao was a wonderful tour guide. I contacted him to ask some questions about the tour and he was accommodating with my questions and the date for our tour as well. He explained every thing to us and was on time to pick us up. He was really good at explaining the history and information about the temples to us and accommodating if we needed a break from the hot Cambodian sun. Over all it was a great tour. Lao is lovely young man and his english was amazing as well. Definitely recommend him. TOUR GUIDE RESPONSE: Dear Jay Sikorski, Thank you for your wonderful feedback. It was great to be your tour guide. I hope that you enjoy living in Cambodia and hope to meet you again. TOUR GUIDE RESPONSE: Dear Wee Kong Chen, Thank you so much for taking to summit the great review. Hope to see again in Siem Reap. Excellent guide, very good english as well. TOUR GUIDE RESPONSE: Dear Karl, Thank you so much for taking to summit the great review. Hope to see again in Siem Reap. Lao was a great tour guide. his English is good, as is his knowledge of the temples. He got the right balance of what we were looking for on this tour. TOUR GUIDE RESPONSE: Dear Marshall, I appreciate your positive feedback about my service. I am glad to hear that you enjoyed the tour in Siem Reap. Please do no hesitate to contact me through ToursByLocals when you visit Siem Reap or Cambodia again. Our Guide Lao was ingredibly knowledgeable and offered insights to the history of the area that we would not have learned on our own. We toured the ruins with our 13 and 10 year old boys and Lao did an amazing job of story telling about the carvings in a way that kept our kids totally engaged. I highly recommend him for anyone looking for a top notch tour with a guide that speaks perfect English. TOUR GUIDE RESPONSE: Thank you very much, Dave and family for choosing me your tour guide in Siem Reap and your great comment. It was my pleasure to show you around. It was such an enjoyable tour. I was very glad to serve you and your family. We, tourbylocals.com, do hope to serve you services again in the future.